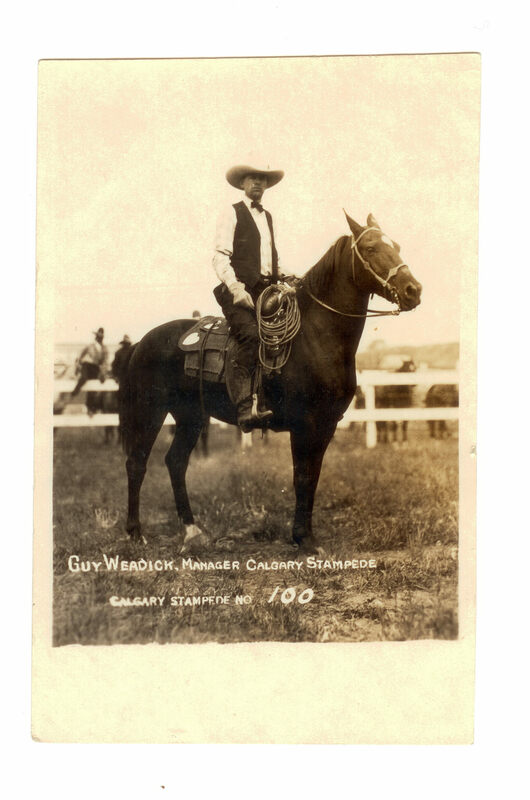 Shortly after the founding of Calgary, visionary cowboy and travelling showman Guy Weadick came to town. In 1908, “Calgary was in a time of transition,” said Christine Leppard, the historical specialist with the Calgary Stampede. The Mounties, ranchers and farmers started claiming the countryside of Southern Alberta in the 1880s. The next wave followed the railroad, bringing workers with skills across the industries. The first big population boom of the West took place between 1900 and 1911. With one quick visit in 1908 to the quickly growing city, Weadick was inspired. It wasn’t until 1911, however, that Weadick returned to Calgary to pitch his ideas. He caught the interest of a wealthy pioneer rancher, George Lane. With the help of Lane, Pat Burns, A.J. McLean and A.E. 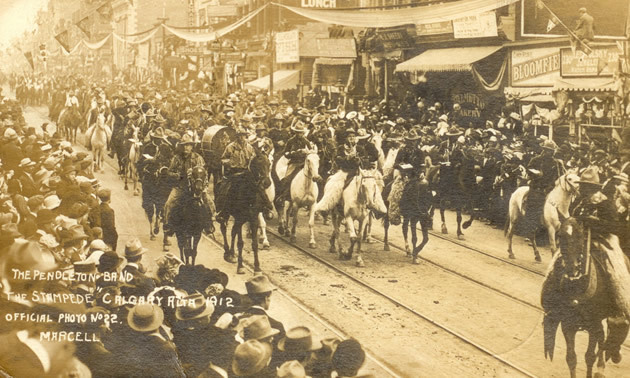 Cross—the Big Four—Weadick successfully organized the first Stampede in 1912. Each of the Big Four contributed $25,000 to the event. According to Leppard, these men were “leaders of industry” and “boosters for the area,” participating in several organizations. The 1912 Stampede broke even. People came from across the continent to compete or watch the show—over double Calgary’s population attended the opening parade that year. The first Stampede looked a lot different than it does now. There were no midway or mini-donuts. “The first Stampede was all about the rodeo,” Leppard said. The rodeo itself was a learning experience. Events dragged a little long because there was no defined infield—the horses had free range of the full arena. Also, there was no eight-second rule. Riders rode their bucking broncs to a standstill, regardless of how long it took to tame them. One rider took 10 minutes to ride a particularly tough horse to a standstill. “People loved the experience,” Leppard said about the first Stampede. “Some people thought it competed too much with the Exhibition,” but that problem was resolved in 1923 when the two events merged. 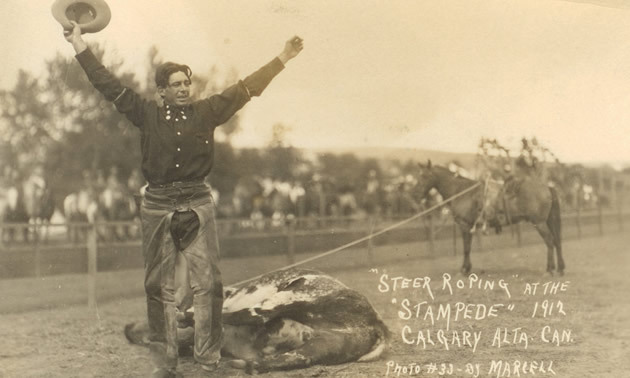 The Stampede celebrated the values of the growing West. The yearly Exhibition was already in place when Weadick arrived; it celebrated local agriculture. “Ranchers and farmers would bring in their horses to show,” Leppard said. “Farmers brought in their best products to compete and celebrate the bounty of the region.” But Weadick thought the growing city could celebrate their western hospitality in a much bigger way. “The Stampede offers an incredible unifying celebration for the city, and it always has,” said Leppard. “If you put on your jeans and cowboy hat, you’re automatically a part of the spirit of celebration at the Stampede.” The Greatest Outdoor Show on Earth is rooted in Alberta’s shared values of western hospitality, integrity, pride of place and commitment to community. The Stampede celebrates a collective identity of Western Canada and its growth through the years. To learn more about the Stampede and Calgary’s history, visitors can check out the Quirk Cabin in Weadickville. “It’s a historic cabin from the 1880s, and each year the historical committee puts up a display that looks at some component of Stampede history or the history of the West,” Leppard said. There is also a photo display in the Western Oasis at the Stampede, and the Indian Village, which celebrates the culture of the Treaty 7 First Nations of the area. The Indian Village was a part of the very first Stampede. Like most people in Calgary, Guy Weadick is from somewhere else. However, he felt inspired by how Calgary maintained its cowboy charm even as it transformed into a modern city. Weadick began his showbiz career with the Miller Brothers’ 101 Ranch Wild West Show. It was with this travelling show where he met his wife, trick rider Flores La Due. “The story of the Calgary Stampede, its origin and its success, is the story of the West itself,” is how Weadick starts off the tale of how the Calgary Stampede began. When he goes on to mention the Big Four who supported his idea to create the Stampede, Weadick said, “They were men of vision and had great faith in the possibilities of this country for the future.” This optimistic vision of the future is a representation of both the Stampede and the city of Calgary. The Big Four instructed Weadick to “make it the greatest thing of its kind in the world.” He did just that, setting the stage for over 100 years of Wild West entertainment.